Madrilenian chef Omar Allibhoy wants to bring authentic yet modern Spanish tapas to London, and he has an impressive CV! Having worked at former ‘Best Restaurant in the World’, El Bulli in Barcelona; Maze in Mayfair (Gorden Ramsay called him the ‘Antonio Banderas of cooking’); and El Pirata De Tapas in Notting Hill, he went on to start his own Tapas Revolution chain. Omar already has bars in Westfield and Bluewater shopping centers and has now finally opened a stand alone restaurant on Bethnal Green Road that I was invited to try out. 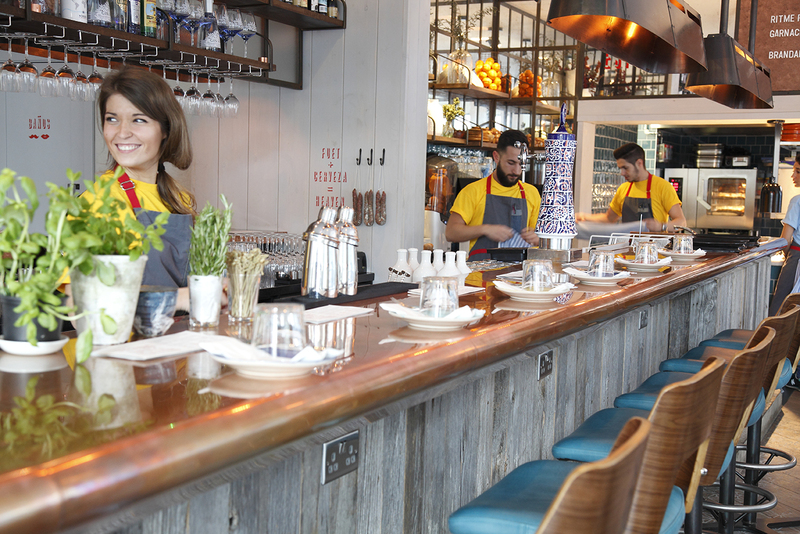 Located in between Brick Lane and Box Park, the sleek interior retains the rustic and animated atmosphere you would expect in a classic Spanish tapas bar. The open kitchen and Jamón prep area face onto closely packed high seated tables, whilst a grand bar bathed in light from the chunky overhead copper lighting runs through the middle of the restaurant. Here staff serve an assortment of the most enormous and refreshing Gin and Tonics I have ever attempted to daintily sip on. So, gin is big in Spain (did you know?!) and accordingly, specialist Spanish gins are imported to supply their mouth watering G&T menu. I would highly recommend ducking in on a sunny spring evening if only to treat yourself to one of these beauties. I started with the Gin Mare and Fevertree Mediterranean tonic served with basil and rosemary, before merrily moving on to the “Pomada”, Xoriguer Gin and Fevertree lemonade served with grapefruit and lime. They also have an equally fruity sounding cócteles menu as well as sangrias and cervezas. Charming and passionate, Omar brought out a selection of dishes from the tapas menu for us to try. We started off with the Jamón ibérico de bellota Joselito – the best ham in the world according to him! Whilst agreeing with this statement is beyond my amateur hammy experience, it really was delicious and it’s delicate sweet flavour went perfectly with the accompanying Pan con tomate (grilled bread rubbed with garlic, penjar tomatoes and olive oil – “this is NOT bruschetta”). The Iberico pigs are unique to the woodlands of Spain and the meat is cured and dry-aged for 36 months to develop its sweet and nutty flavour. The power cut out to the entire street part way through the night and as I watched sad cinema go-ers getting turfed out of the Rich Mix, my first thought was, “Oh well. At least we’ve got the ham”. But then, the power was on and we were treated to Patatas bravas and the syrupy sweet Croquetas de creps y trufa (truffle, boletus mushrooms and bechamel croquettes). Being a sorry snuffling sow, these were my favourite favourite things. The Atún con ajoblanco y vinagreta (tuna carpaccio with almond sauce and citrus vinagrette) was fresh and beautifully presented, and the grilled, marinated flank of beef was spicey, tender and rare. Also, special mention goes to the Carrilleras ibéricas al chocolate (Iberian pork cheeks braised with chestnuts and chocolate sauce) for its commendable palatal contribution. Just as the table was mid mumble about how stuffed we all were, Omar brought out a selection of sweet desserts and everyone shut up. The desserts are not on the menu and unfortunately my dog ate the piece of paper that I wrote them all down on, but it was something like; a melty custard filled brioche, a panna cotta/crème brûlée hybrid with caramel sauce and a chocolate mouse which were all light, creamy, sticky, heavenly. Mmmm. The food at Tapas Revolution is delicious and, as I said, the gin!! It has to be said that the bar service was quite slow, but worth it in the end. It’s all reasonably priced, comparable to it’s Spanish counterparts, and the restaurant itself is tastefully designed. And of course, the best thing about tapas: no food envy.